Als je wat afwisseling nodig hebt, zijn er vele interessante middeleeuwse dorpjes (Belmonte Calabro, Fiumefreddo en Longobardo) te verkennen in het gebied. Casa fiori hat alle unsere Erwartungen übertroffen. In unvergleichlich schöner Lage -hoch über dem Meer- strahlt das Haus ein Ambiente aus, das einlädt zum Verweilen, zum Geniessen und zum Erholen. Die Ausstattung lässt keine Wünsche offen. Die Zimmer sind geschmackvoll eingerichtet und die vorhandene Klimaanlage sorgt zudem für einen erholsamen Aufenthalt, selbst bei hohen Temperaturen. Von der Terrasse aus öffnet sich der Blick auf Küste und Meer und bei guten Witterungsbedingungen bis hin zum Stromboli. Ein besonderer Dank geht an die Vermieter, Pia und Tom, für die herzliche Aufnahme und Zuwendung. Wir freuen uns sehr, dass es Ihnen bei uns gefallen hat und hoffen, dass wir Sie bei Ihrem nächsten Besuch in Kalabrien nochmals bei uns begrüssen dürfen. Es war uns ein Vergnügen Sie kennenzulernen. Ce fut un plaisir de vous rencontrer. Vous étiez des invités très gentils et nous serions heureux de vous revoire a Belmonte. Wir haben die ersten beiden Septemberwochen bei Pia und Tom im Haus Fiori verbracht und waren begeistert von der schönen Lage der Unterkunft. Hoch über dem Meer gelegen hat man einen tollen Blick auf das Meer mit fantastischen Sonnenuntergängen und Blick auf den Stromboli bei guter Sicht. Unsere Gastgeber waren sehr zuvorkommend und gastfreundlich, das Haus ist stilvoll eingerichtet und sauber und von einem schönen Garten umgeben. Wer Ruhe und Erholung sucht, ist hier genau richtig. Der Strand in Belmonte Marina ist sehr lang, das Wasser glasklar und es waren kaum Leute da. Unsere Kinder liebten die großen Wellen. In der näheren Umgebung gibt es urige mittelalterliche Dörfer zu besichtigen, in Amantea gute Einkaufsmöglichkeiten und eine leckere Eisdiele (Sicoli). Ausflüge nach Tropea und Pizzo sind ebenfalls lohnenswert. In der näheren Umgebung findet man zahlreiche gute Restaurants, aber auch selber kochen ist in der gut ausgestatteten Küche kein Problem. Ein Auto bzw. Mietwagen ist jedoch erforderlich. Wir haben die Zeit bei Pia und Tom sehr genossen und können diese Unterkunft auf jeden Fall nur weiterempfehlen ! Es war ein Vergnuegen Bettina und Familie bei uns zu haben. Es hat Spass gemacht uns mit ihnen zu unterhalten und mit den Kindern zusammen die Mandeln zu ernten. After 3 weeks of sight seeing in wonderful Southern Italy we wanted a relaxing location for the last few days of our holiday. When I spoke to Pia to make the booking, she was so helpful and warm that I knew we would enjoy our time at Casa Fiori. Pia and Tom kindly met us at Belmonte Calabro train station so we didn't have to rely on sat-nav/GPS to find our way to the house. They gave us a tour of the house and gardens, and made sure we had everything we needed before leaving us to relax for the evening. 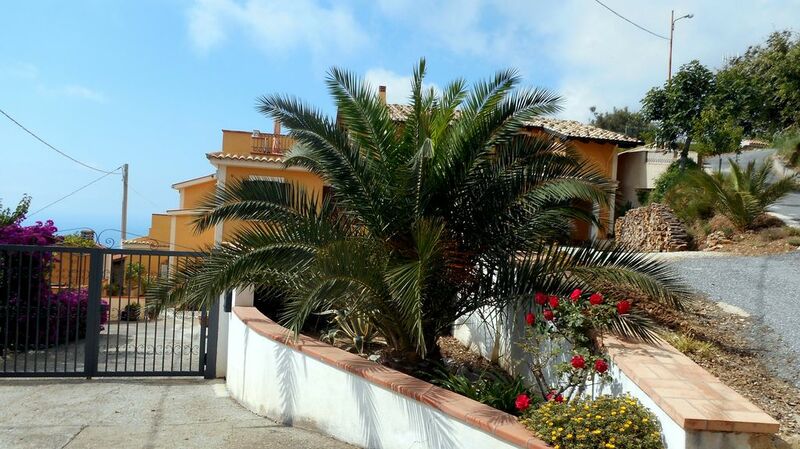 Casa Fiori is spacious, very comfortable and spotlessly clean. It's tastefully furnished and has everything needed to be a real home from home. The living room and bedrooms are well appointed and have a/c and heating should you need it. The bathrooms are modern and fitted with excellent showers. The kitchen is very well equipped and enabled us to buy food locally and cook at home, which was very welcome after 3 weeks of eating out. The outside spaces are great for unwinding and enjoying the stunning views and peaceful surroundings. The local beaches and towns were quiet (in May), but nice to explore. The steps up to the Centro Storico of Amantea are worth the trek, especially for the excellent Gelateria on Corso Umberto I. The towns of Pizzo and Tropea are only an hour/1.5 hours or so away by car, so make good day trips. Pia and Tom have worked very hard to create such a wonderful place and are such natural hosts. We wholeheartedly recommend Casa Fiori and would love to return. Thank you for the glowing review. Pia and I are blushing! It was great having you and your parents and we would love to have the opportunity to chat again - maybe next time with a glass of wine in hand. Or maybe we could do something more adventurous, like making a pizza in the stone oven. I was hoping to find a beautiful view of the Med for my wife and daughter as we visited with family in nearby Lago. Casa Fiori and its gracious owners, Pia and Tom, provided a glorious setting and restful experience during our last four days in Italy. I could not have asked for better accommodations than what we had in Casa Fiori. Pia and Tom met us at the Belmonte-Calabro train station and led us to their mountain top location. The winding road, while daunting at first, became second nature over the next several days. Our reward was breathtaking views of the Calabrian coastline and the Med's crystal blue waters. Glorious sunsets and even imposing views of the active volcano Stromboli and the Aeolian islands behind left us speechless. The home was well appointed and comfortable. Pia and Tom made our stay truly carefree. We would recommend their properties wholeheartedly! Beautiful house in a beautiful region. We were two couples in our party and we absolutely loved Casa Fiori. Tom and Pia were terrific and extremely helpful. The property is absolutely beautiful and has all you could need. We cooked a couple of dinners at the house and felt right at home. The views are fantastic. The house sits high on a mountain side facing the Mediterranean Sea. We could not have asked for a better place to stay. It was a pleasure having such wonderful guests and we really enjoyed the fantastic seafood dinner you prepared.